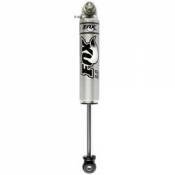 FOX Racing has been manufacturing performance equipment for dirt-track and motocross racing for years and now make some of the finest truck shock absorbers available. The FOX 2.0 Adventure Series shocks have been built specifically for Zone Offroad and valved to compliment your Zone lift kit. Utilizing FOX's proven damping technology to provide a comfortable on-road ride and predictable off-road handling in a variety of conditions, they use a 2? OD steel body construction with a large 5/8? heat treated hard chrome plated shaft for increased strength and durability. The monotube design uses an internal floating piston (IFP) to separate the shock oil from the high-pressure, nitrogen charged gas chamber. This eliminates oil aeration for fade-free performance from the vehicle specific valved shocks for in rough terrain. Get more out of your truck or Jeep with Zone Offroad and the FOX Adventure Series 2.0 shocks. Suspension, Lift & Steering parts to keep your truck performing smoothly and precisely, ensuring your ride comfort and handling performance, rain, snow or shine. Description: 1999-2004 Ford F250 / F350 4WD For use with BDS steering stabilizer mounting kit # 55373. Image shown may be slightly different by application.